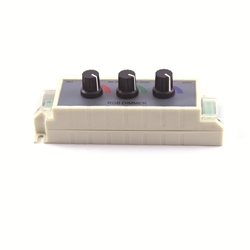 3 channel manual LED color controller. Three knobs adjust the color of Red, Green, and blue to achieve thousands of static color combinations. Works well with HTPR series ribbons in 12 or 24VDC. Needs a power supply for input power. Combine with HTHUB6 to connect with CYRON Media Highlighter Lightbars. NOTE: Power supply and lights are not included.